Contents Copyright© 2011 by the various contributors. Click here for use guidelines. Don't forget our Q and A page. emergency workers or hospital ERs? Links to EMS Subjects found on other pages. Click on each patch to learn more about that level of training or just scroll down as you read. In the past, many states used their own curriculum and tests. Today, many have shifted to the National Registry of Emergency Medical Technicians criteria and tests. 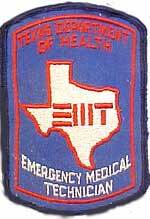 You might see the following patches either alone or with the patches of a state or other EMS system. The fire service and emergency medical care, or first aid, have a long standing relationship. From the very first contact with fire there has been the need to minister to those who have been injured by it. It was always the firefighters who rescued people from buildings which were on fire. Fire engines carried first aid equipment for most of the twentieth century. When more advanced emergency procedures were developed for first aid providers it was only natural to involve the fire service. While some cities, or other areas, have placed the responsibility on private industry, or other forms of emergency service, EMS still is a large part of any fire department. Fire apparatus now respond to a large list of potential, or known, medical calls. Fire companies respond on traffic accidents and heart attacks, just to name two examples. For better or worse, many cities are beginning to view medical runs as a source of revenue that helps to support or improve the level of care they can offer. No matter how one may feel about the subject, EMS and the fire service is probably here to stay. EMS in the fire service has not come without resistance and problems. Many departments, with strong unions or other forces, have resisted the trend to have their members trained as paramedics. In many departments the older members would express that paramedics were not "real firefighters". I have heard it said that paramedics were afraid to fight fire and that is why they volunteered for the job. But that thinking is dying out as the old guys leave. 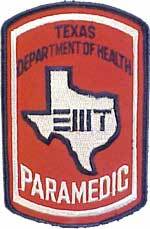 EMS has been in many fire departments since the mid 70's or early 80's. A very large percentage of today's fire officers were once paramedics on an MICU. Many fire chiefs are now also former paramedics. This is something almost unheard of just ten years ago. 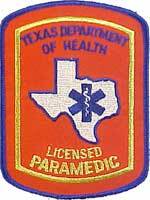 The Texas EMS format can be used as a model for most EMS systems. While there are variations between Texas and other states, there is even enough variation within Texas alone to give you that we could consider this just a basic understanding of EMS in general. Emergency Medical Services, in general, appears to be a misunderstood concept. But this is not just in Texas. People all over the U.S. sometimes seem to not know the difference between an “EMT” and a “Paramedic”. 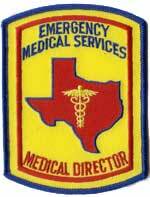 The following is how EMS is organized and run in Texas. It is similar for just about everywhere in the U.S. There are national standards for EMS, but states can vary some of the requirements and procedures. The medical director for a system has the final say about many things. He or she can forbid or allow just about whatever they choose. There are national standards for things like Advanced Cardiac Life Support (ACLS) and these standards are adhered to in almost all jurisdictions. Many states, including Texas, have adopted the standards and tests of The National Registry of Emergency Medical Technicians. 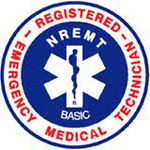 (NREMT) Note: Passing a NREMT exam does not automatically give one a license or certification to work as an EMT. A state or other jurisdiction can use this as just part of it's certification process. A city might require that a paramedic be certified by the National Registry, the state and then tested and approved by the county or other medical director. Starting with the lowest amount of training, the following is a description of the different levels of (Pre-hospital) Emergency Medical Services in Texas. Basic First Aid - This is about the same as you would get at a Red Cross first aid class. This usually includes CPR etc. They are often trained in the use of AED's on cardiac arrest patients. This level is sometimes referred to as "First Responder" training. People who may come in contact with the sick or injured, but patient care is NOT their primary function, may be trained to this level. People such as police officers and helicopter pilots often receive this training. NOTE: I recently received an email questioning this description of the "ECA" certification. The email stated that ECA and "EMT-B" were about the same and that "ECA's everywhere would be appalled to see that your site says how they are trained. Especially after attending over 70 hours of classroom time over many weeks." They also compared ECA to EMT-B. "The only 2 differences are Combi-Tube airways, and EMT-B's have many clinical hours to do." Please allow me to quote a couple other sites and I will let you decide. If you Google - Red Cross ECA - you will see that they offer what they consider to be an equivalent course. It is possible that some jurisdictions train ECA's in special skills. Local medical directors can do whatever they want. It is also possible that the term has a different definition elsewhere. But I still don't think that the training described by the email I received pertains to "ECAs everywhere." More training in anatomy - Can administer Oxygen and recognize more serious conditions. They are trained to provide spinal protection and will often carry AEDs for heart defibrillation. Depending upon the state, training consists of up to 280 hours of training which includes hospital work and riding on an ambulance. Some departments may refer to this level as "EMT-B". 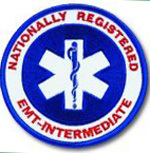 This does not imply that there is an "EMT-A" or an "EMT-C" level of training. This usually means "EMT-Basic". They consider the other levels as "Advanced" training. 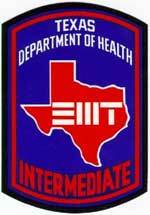 Note: There are states that refer to the different levels of EMS training as "EMT I", "EMT II" and "EMT III". 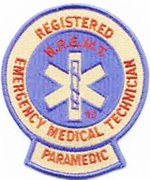 Some areas may also call a basic EMT an "EMT-1". In Canada you will find the term "EMA" which stands for Emergency Medical Attendant. The different levels are indicated by "EMA-1", "EMA-2" etc. Assistant to Paramedic-Also sometimes called “EMT Special Skills”. This person is trained to start IV’s and perform other important tasks to assist the Paramedic in performing Advanced Life Support. In truth, at times there might be very little difference between an EMT-I and a paramedic because the "special skills" they possess might be very similar to a paramedic's skills. To confuse things more, there are several distinctions of paramedics. Certified Paramedics - They have completed a certified training program. This includes training in anatomy and physiology etc. They have also passed the nationally prescribed exam for paramedic. These paramedics must retake an exam every 2-4 years. (Depending upon national certification and medical director.) They are also required to complete 40 hours of continuing education each year. Licensed Paramedics - This person has received all the required training and has a degree that includes anatomy and physiology etc. The requirements for regular retesting and continuing education are different at this level. Note: Just because you see the "Certified" style of patch does not mean that your paramedic is not licensed or have a huge amount of training. The "licensed" patch is new and many are not bothering to change it on uniforms. 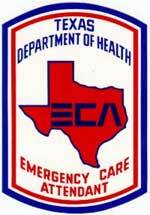 Often cities do not pay for these patches or the money that must go to the department of health for the license. There is no difference in the level or quality of care. Tactical Paramedics - Trained for tactical operations. These are usually part of a police tactical weapons team. The patch is usually "subdued" in color. This means gray and black colors only. 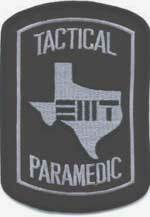 The state certification for "Tactical Paramedic" has been around since the early 90's or before. (Although the use of them has been very slow to catch on.) These can be members of the police department or the fire or EMS department. They typically have to go through the SWAT / Tactical Weapons Training and SWAT tactics training. If fire department personel are used they can drive the SWAT armored vehicle since they already have the proper state lisense for that. In Charge of All the Paramedics is the "Medical Director". Each EMS system is under the watchful eye of a "Medical Director". This physician oversees the program. Prescription meds and devices, under federal law, can't be purchased or used without a doctor's orders. The Medical Director is who authorizes all use of prescriptions. Sometimes it is described as though all the EMS workers are practicing medicine on this doctor's license. For this reason the medical director has a right to insist that he or she know that the workers are trained and qualified to do the job. Medical directors have complete control over who works in their system. If a medical director wants the people in their system to be trained over and above the state minimum, then that is the way it will be. Medical directors will taylor a system for their area. For example: Some Texas counties are hundreds of miles across and may have a population of less than 10,000. A medical response may take an hour to arrive and be an hour (or more) to the nearest hospital. In these counties, snakebites are common. EMS personnel need to know how to deal with this and carry treatments. But in other counties an MICU may never be more than five minutes from a major hospital. For certain conditions, such as the very rare snake bite, the treatment will be just transport. Every region has it's own needs and concerns.